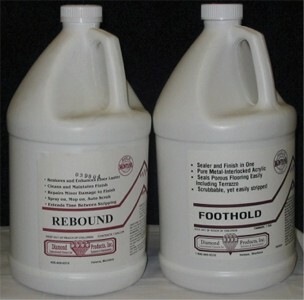 Foothold is a well-established, favorite combination-type sealer-finish -- eliminates the need for separate products. Based on a metal-interlocked acrylic polymer, Foothold has 16% solids and offers excellent ease of application, the ability to achieve a rapid multiple coat deposit, fast curing for outstanding and immediate water and detergent resistance, and long wearing, easy to maintain surfaces. Coverage 2500 sq. ft. per gallon.